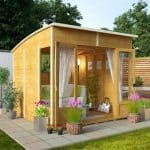 With a very modern design the 8 x 8 Waltons Wooden Corner Summerhouse is one very cool and smart looking corner summer house. 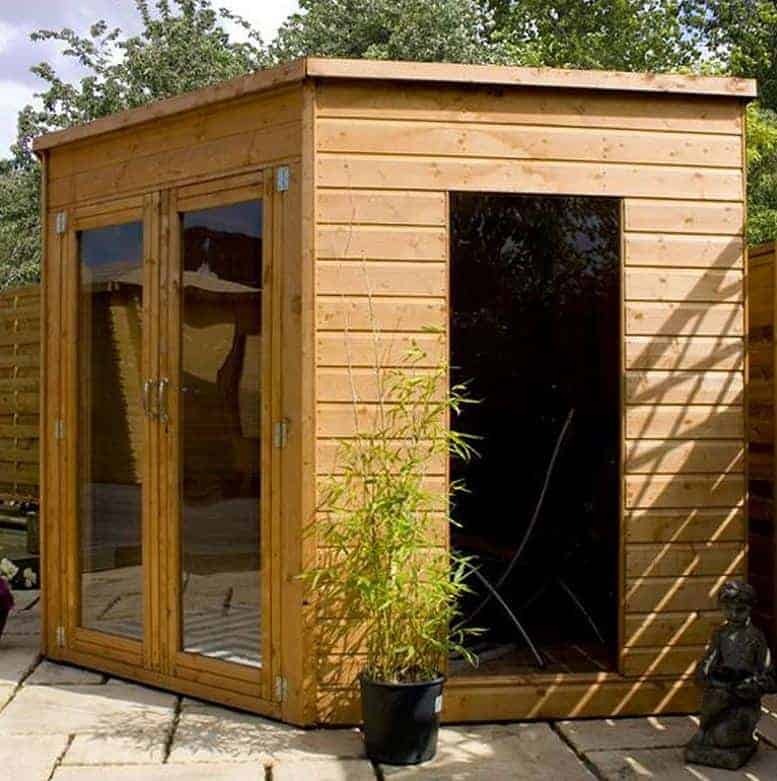 This is ideal for those of you who want a summerhouse that is not only going to provide you with a fun place to enjoy a meal, glass of wine or even an outdoor movie with the kids, but also a summerhouse that is going to look awesome in your garden. The large windows on each side and the double doors make this one of the most open and inviting summerhouses you will ever see. It is also a very good size as it will be able to fit into most sizes of garden. This is a corner summer house that has been made very well and is being sold at a very reasonable price. The structure is very solid thanks to being made with 12 mm thick tongue and groove boarding and then supported with a very robust frame. This summerhouse is going to last for many years because of this. The windows are just as strong as they are easy on the eyes, thanks to being made from anti shatter styrene which is great if you have kids playing in your garden. The 8 x 8 Waltons Wooden Corner Summerhouse really is one very gorgeous looking corner summer house. We have seen many, many summerhouses over the years, but this one really caught our eye. It has a rather different style than a traditional summerhouse. Actually we feel that it has a kind of pool house look to it. It is a very decent size offering you 8 feet of width and depth. The floor space is not huge, but we feel 8 x 8 is a decent size for the average garden and you will be able to fit a few chairs, table and other items inside without it feeling to cramped. The headroom it offers is 6 feet 3 inches at the lowest point and 6 feet 7 inches at its highest so you do have a comfortable amount of headroom. Having a flat pent style roof is not unusual for a corner summer house. The roof is made with 8 mm thick solid sheet boarding and covered with roofing felt. Now we do wish that they used a little thicker boarding for the roof, but we do not see you having any problems with this. We just wish they used something a little easier on the eyes as the rest of the summerhouse is so nice. 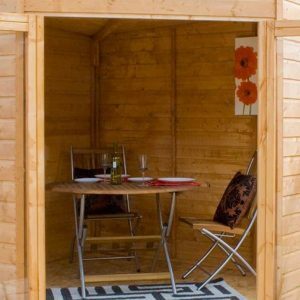 We love the cladding that they have used for the 8 x 8 Waltons Wooden Corner Summerhouse. 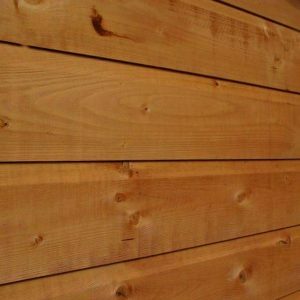 It is 12 mm thick tongue and groove shiplap cladding and it is so well made that it is all joined together so tight that it is simply impossible for rain to find a way inside. We love the smooth look that this cladding has and feel that this is what is mainly giving the summerhouse its modern look. The frame that they have used is very impressive. A corner summer house needs to be a robust structure, especially if you want to get many years of use out of it. We are very pleased with the 28 mm x 28 mm frame that they have used. This is not the thickest frame we have ever seen, but using this frame was a very smart design choice as this along with the cladding is going to make for one very strong and long lasting structure. We also like how the frame is not too big and bulky so it will not stick out too far inside the summerhouse. 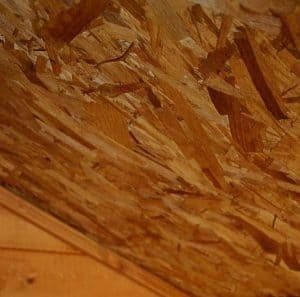 The floor is made with the same kind of boarding that the roof is, but it is a little bit thicker at 10 mm. We really wish they would have used tongue and groove flooring here. Not because there is anything majorly wrong with solid sheet boarding, we just feel that tongue and groove boarding would have gone very well with the design of the summerhouse. Still you can always cover it with some laminate or even just a smart looking rug. 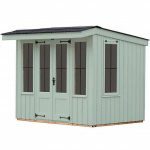 The 8 x 8 Waltons Wooden Corner Summerhouse will come to you having been dip treated. This is the case for the majority of Waltons products so we are not surprised. It does mean though that if you want this corner summer house to retain its good looks that you will have to treat it. We always think it is best to treat it sooner than later. Once a year a fresh coating of wood treatment should be applied. You do this and the wood will never show any signs of rot. As long as you do treat the wood the way that Waltons recommends that you do, you will be covered by their very generous 10 year anti rot guarantee. The front of the structure is actually mainly made up by the large set of double doors. These doors look awesome and they will allow you to have a good view of your garden when you sit inside even when they are closed. The doors are 3 feet 11 inches wide and 5 feet 9 inches high so there is plenty of room to get yourself in and out. The doors are finished off with some very smart looking hinges. Each door actually has three hinges which was very nice to see. The windows on the doors are made from 2.5 mm anti shatter styrene which is great. As well as this though there is a large window on each side of the corner summer house. We love the look of these windows and you will certainly never have to worry about natural light getting inside as they will allow it to flood inside. Both windows are fixed, but actually in this case we do not mind as we feel fixed windows fit much better with the design. 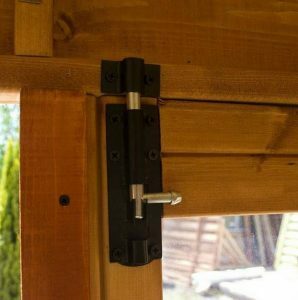 A rim lock is included so you can ensure the large double doors that sit front and centre on the 8 x 8 Waltons Wooden Corner Summerhouse are locked up at night. The windows are fixed so there is no worry about someone forcing them open and in general we are very happy with the level of security this summerhouse offers. The windows that are on this corner summer house are huge so you are not getting much privacy here at all. You could always go for some curtains or blinds, but we personally feel that covering those windows up would be a real shame. Just make sure you are always wearing pants and the fact there is a lack of privacy will not be a big deal at all. This summerhouse does come with a free tub of golden brown treatment which will look great and treat the wood perfectly, but if you want something a little brighter, darker or just something that fits your garden better, then be sure to have a look at all the different coloured wood treatments that are on the market right now. 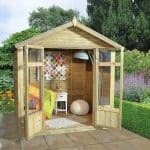 The 8 x 8 Waltons Wooden Corner Summerhouse has a number of different extras for you to consider. They have an installation service, but at £224.95, we feel it is a little highly priced. You can upgrade the felt to their superior duty felt which can be in charcoal or green. These both cost £29.99. You can also upgrade the security. They have a Weatherproof Padlock with Hasp & Staple, which costs £9.99. Or if you really want to kick your security up a few notches, they have the Neulock Sold Secure Pad-Bolt which can be added for £39.99. 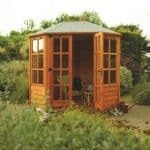 This is one very well made summerhouse and we are very impressed with its incredible good looks. If they had gone for a tongue and groove roof and floor then we would have probably scored this at a 9.5! Structurally this has been designed to last for many, many years, but in order to keep it looking fantastic and to keep rot at bay. You are going to have to give it a bit of TLC on a yearly basis with a fresh coating of wood treatment. 8 X 8 is not huge, but it is still a good enough size for the average couple or family. It is actually a lot more roomy than you would think and with a bit of crafty item placement, you can make the space go very far. We do not see anyone having any trouble putting this together. It should take you and the person you con or bribe into helping you out no more than a few hours. 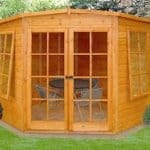 This is a great looking summerhouse and we feel that the price it is being sold for is very reasonable. 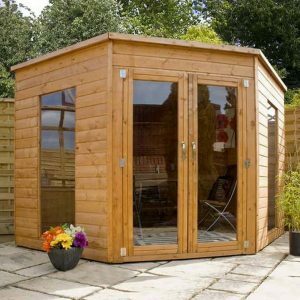 Final Thoughts: We love the look of the 8 x 8 Waltons Wooden Corner Summerhouse. It really does have a cool and modern look and we are sure that is going to make it a very popular corner summer house. The size is just ideal it is not overly large, but it still offers you a very respectable amount of room to play with. We feel that this is perfect for those with a family or just a couple looking for a fun place to relax. If you want a summerhouse that has a smart design, is well made and is going to give you many years of use without you having to break the bank in order to afford it, then we highly recommend you consider this one.